The argument against a permanent ban on deepwater drilling is increasing day by day as the Gulf spill continues to turn from a disaster into a tragedy, but reading an article on The Oildrum raises the possibility that this could now be a battle to avoid what could become “the worst thing you can think of”. The situation makes the Australian Government’s ‘drill baby drill’ approach to putting out new deepwater drilling tenure in Australian waters, some of it in areas so environmetnally sensitive they are being considered for marine sanctuaries, even more ludicrous. Below is a summary quote from The Oildrum article, the link to the full article is here. I very much hope they are not right, but the observations they make are very compelling. All fingers, toes and tentacles crossed for the Gulf. In February the Happy Squid wrote questioning the ‘good news’ spin put on the relocation of animals from Barrow Island Nature Reserve to other locations to make way for the massive Gorgon LNG project. Today, PerthNow has reported that a number of the animals relocated to the mainland have died, primarily killed by foxes – including half of the tagged brushtail possums, a statistic likely to be representative of the other animals relocated to the area. There had also been fatalities of some endangered animals moved to safer locations such as islands and enclosures, although overall results had been better. Read the full article here. This is just the beginning of a program involving the relocation of 1000 animals each year for 12 years. It follows more bad news for Chevron after a baby endangered turtle was found in a dredging barge during the start of massive dredging works through the pristine coral reefs that surround the island. The Total Output in Rodney dependent on the existence of the marine reserve is estimated to be $18.6 million per year. Some $12.1 million of this is direct spend by visitors and the balance is the result of flow-on effect through the district economy. Associated with this output is Total Value Added of $8.2 million per year and employment for 173 FTE’s (full time equivalents) in Rodney, including 10 jobs in marine reserve-related activities. DOC’s total annual budget at the marine reserve varies but is approximately $70,000 per year, including a total staff input of 0.8FTE. The Cape Rodney Okakari Point Marine Reserve was established in 1975 and is the most popular marine reserve in New Zealand. The reserve received an estimated 375 000 visits in the year to February 28th, 2008. The majority of day visitors (54 %) said that if the marine reserve did not exist then they would not visit, or would be unlikely to visit, the district on the day they were interviewed. Download the Hunt 2008 Economic Impact Analysis of the Cape Rodney Okakari Point (Leigh) Marine Reserve on the Rodney District here. The report compliments work undertaken by Save Our Marine Life to look at the economic costs and benefits of a network of marine sanctuaries in WA’s southwest that found long term economic benefits from increasing marine protection. More information on this report here. Speech by report author Dr Martin Van Bueren here. The finding of a dead baby endangered turtle in a dredge tank at Chevron’s Gorgon project has put the spotlight back on this project. Today, environment group WWF-Australia called for an immediate halt to the dredging project. The Gorgon project has been dogged by controversy since day one, when an Act of Parliament was required to create space for the massive LNG facility out of the Barrow Island A-Class nature reserve. The Act was made against the recommendations of WA’s environmental watchdog, the Environmental Protection Authority (EPA). Barrow Island is an important refuge for a number of species of small mammals now extinct on the mainland. Aquifers under the island house unique underground life like the blind gudgeon, a fish species that lives entirely underground. The beaches next door to the planned new LNG facility are one of the largest known rookeries for the endangered flatback turtle. The waters surrounding the island are a pristine and diverse coral reef and a marine park other than the special circular hole removed from the park to allow for the shipping channel and port that will service the new industrial facility. The oil industry is already established on the island, a small operation has been producing oil since the 70’s, but nothing of the scale of this new development has been seen before. Despite the EPA again recommending against the development on Barrow Island during the Environmental Assessment process, some of the strongest recommendations ever made by the EPA, the project has been given approval and development has begun. Since the project began there have already been numerous breaches of the environmental conditions imposed. The quarantine requirements are particularly strict, because feral animals as small as an ant could devastate the nature reserve. 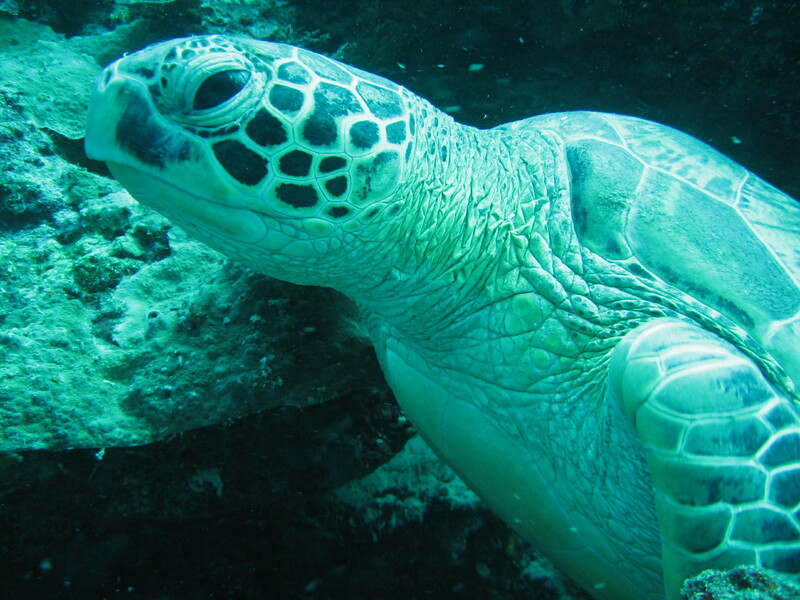 The turtle death has occurred at the early stages of development – as one of Australia’s largest ever dredging projects blasts its way through the pristine coral gardens to create the massive shipping channel required to service the new port. The saddest thing is for a small amount of extra money, the whole facility could have been constructed on the mainland, away from the sensitive environment at Barrow Island. Keep a close eye out – this turtle death may well be just the beginning of the woes that Chevron has bought upon itself and the environment by their decision to locate the Gorgon project on Barrow Island. Conservation groups and Margaret River locals have used the opportunity provided by the community cabinet meeting in Como last night to protest against plans for a new oil lease just 83kms from Margaret River, and to demonstrate the strong community support for greater protection of marine life in marine sanctuaries. The new Margaret River Oil Lease is within an area also under consideration by the Federal Government for inclusion in a new network of marine sanctuaries. 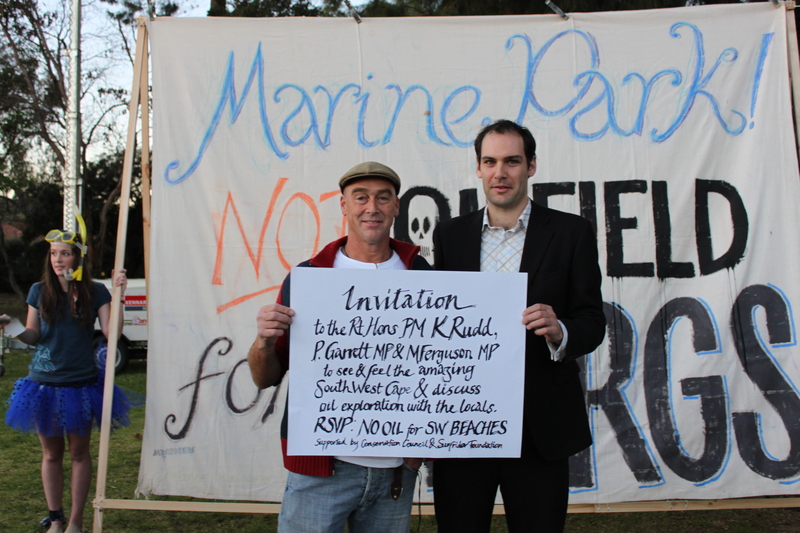 Rob Alder made the trip from Margaret River to the event to present an invitation for Prime Minister Kevin Rudd and Ministers Garrett and Ferguson to visit the pristine southwest beaches that would be impacted by an oil spill in the new Margaret River Oil Lease. The invitation was personally delivered to Minister Garrett by Piers Verstegen, Director of the Conservation Council of WA. At the event he reiterated the campaign message: No Oil for SW Beaches, No Wellhead for our Seabed! The Conservation Council is a member of the Save Our Marine Life campaign for a network of large marine sanctuaries in WA’s southwest waters. Conservation Council Director Piers Verstegen met with Minister Garrett to outline that with decreasing fish stocks for recreational fishermen, and the threat posed by the new Margaret River Oil Lease, marine protection was an increasingly important issue in the WA community. During the community cabinet meeting a question on marine protection in WA from the floor attracted applause from the crowd. No to Oil Drilling off Margaret River!!! All The End of the Line screenings in Aus and NZ here. The Perth Canyon is the ancient bed of the Swan River that now flows through Perth City, Western Australia. The Canyon is larger than the Grand Canyon and is one of only two known feeding sites in Australia for the Blue Whale. Today, on World Oceans Day, the University of Western Australia released never before seen baited camera footage from deep in the trench. The footage will be on all local TV stations tonight. The release was marked by a visit to the UWA Oceans Institute by an MP from all major parties – Liberal Mal Washer, Labors Melissa Parke and Greens Rachel Siewert.